Polar vortex, we are so over you. Thank you, next. Let's warm up just thinking about the 28 best new books of Spring, books that will warm your soul and delight your spirits. From literary to commercial, memoirs to essay collections, historical to fiercely modern - whatever you like, we've got the perfect read for you! 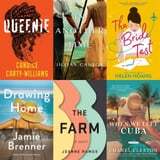 Take a look ahead to see the latest and greatest from authors Helen Oyeyemi, Candice Carty-Williams, Jojo Moyes, Helen Hoang, and more.